Home > PHOTOS > Death Pose & One Corner Dance Is Over, South African Students Begin "Birth Pose"
Death Pose & One Corner Dance Is Over, South African Students Begin "Birth Pose"
According to South African Daily Sun, first it was the death pose, followed by the s*x funeral and sangoma poses. 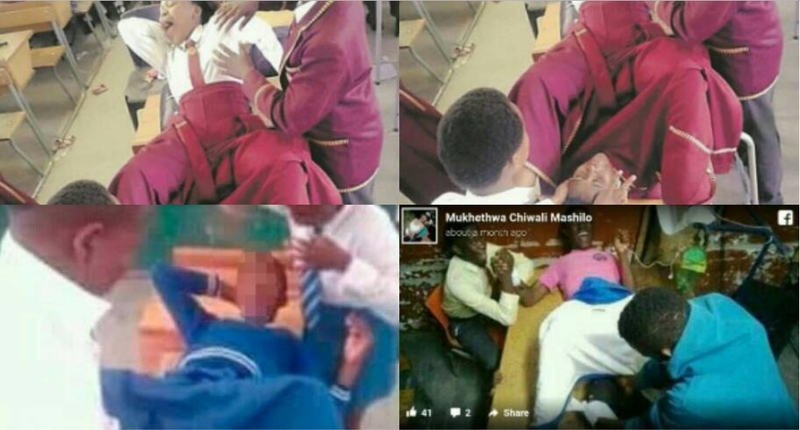 Now the birth pose has taken over social media, with South African school kids leading the pack. But the new pose has outraged parents. The fact that most of the pictures taken are of pupils in uniform has most questioning the culture of learning in some of these schools. Some are now calling for the pupils to be disciplined as the pose is seen as being in bad taste. In one of the pictures circulating online, a pupil’s head is seen sticking out from under another pupil’s skirt. A group of pupils can also be seen posing as doctors and nurses helping to deliver a baby. “These children act like they are bewitched,” said worried Thandi. “What are they hoping to achieve with such pictures? “The sad thing is that most of them are school kids. Mjay Dinoge wrote on Facebook: “This is madness.” Tefo Tladi wrote: “I don’t know if I should laugh or be sad.” Oba Gaebonwe posted: “These kids are out of line and such things are unacceptable. They should be taught the basics of ubuntu.